I’m getting to be such a huge fan of Soft Surroundings! They have such beautiful things and everything is extra soft and high quality. This skirt, right?! 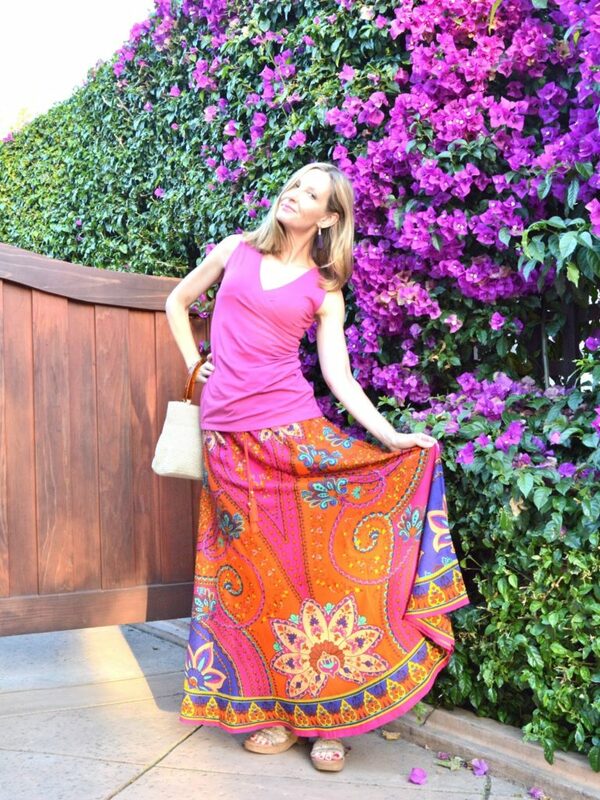 I’m in love … so colorful, fun, and summery! Perfectly paired with this flattering wrap-look top too. This Marguerite Skirt is so festive! And it’s all my current favorite colors, so I can’t wait to wear it with orange and turquoise as well! Look at that pretty Moroccan-inspired border. And aren’t the tassels super cute too? The Shapely Surplice Tank is flattering wardrobe staple. The surplice styling and shirred side seam makes every body look good. And the fabric is super soft modal, pima cotton, and spandex. Check out all the pretty colors. They also make a 3/4 sleeve version. And hey, did you catch my review of Soft Surrounding’s Chevalier Shirt? Soft Surroundings brand is all about self-care and treating ourselves well, a philosophy I can really get behind. Be sure to check out the hashtag #LiveSoft on your social media! Did you know Soft Surroundings has a beauty line too? Please stop by on Sunday for my next post featuring some of their amazing beauty products! Check out Soft Surroundings and see all the gorgeous things from their latest catalog! You dolls make picking three favorite looks difficult every single week, but this week was so impossible I had to pick four! 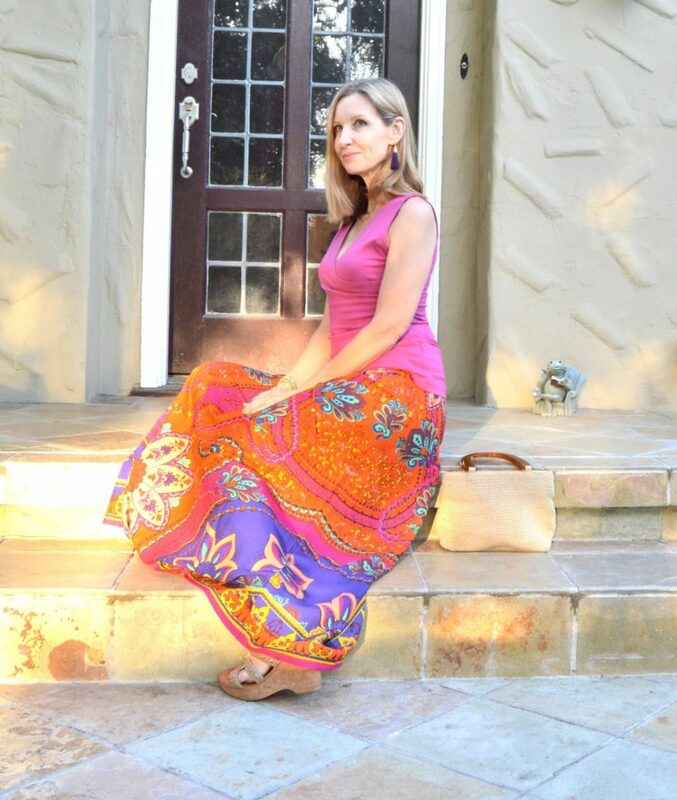 Jess of Elegantly Dressed and Stylish is a vision in this orange maxi dress. Loving this black eyelet dress on Ada of Elegance and Mommyhood. Brittany of Lawyer Lookbook looks fab in bold stripes with a pop of pink. Sandy of Sandy a la Mode and her mini me are so freakin’ adorable in matching bell bottoms. Emma Peach of Style Splash! Congratulations, Emma! Can’t wait to see what dress you pick and how you style it!! Link up, link back, & have fun, Ladies. As always, thanks so much for being a part of our fun! link ups: Visible Monday! Shoe and Tell! Kremb de la Kremb #iwillwearwhatilike link up! Hello Monday! Mix It Monday! How I Summer! Creative Mondays! Let It Shine! A Lovely A La Mode Link Up! Sincerely Jenna Marie! Turning Heads Tuesday! Confident Tuesday! Bloggers Who Inspired Me! Tuesday Fashion Party On Trend Tuesday! Reasons to Dress! Upbeat Soles! Style Perspectives! Trendy Wednesday! What I Wore! The Wednesday Pants! Tucker Up! Jersey Girl Texan Heart! Pumps and Pushups! Color and Grace! Throwback Thursday! Thursday Moda! Thursday Fashion Files! Labour of Fashion! Thursday Favorite Things! Thursday Moda! Top of the World Style! Fine Whatever! Welcome to the Weekend! Passion for Fashion! Fabulous Friday! Fab Favorites! Friday Favorites! A Forage Fashion! Link Party with Osy! Flashback Fashion Fridays! Weekend Wear Link Up! Sheela Writes! The Weekly Edit! Untamed Style! Edge of the Week! link ups: Visible Monday! Shoe and Tell! Kremb de la Kremb #iwillwearwhatilike link up! Hello Monday! Mix It Monday! How I Summer! Creative Mondays! Let It Shine! A Lovely A La Mode Link Up! Sincerely Jenna Marie! Turning Heads Tuesday! Confident Tuesday! Bloggers Who Inspired Me! Tuesday Fashion Party On Trend Tuesday! Reasons to Dress! Upbeat Soles! Style Perspectives! Trendy Wednesday! What I Wore! The Wednesday Pants! Tucker Up! Jersey Girl Texan Heart! Pumps and Pushups! Color and Grace! Throwback Thursday! Thursday Moda! Thursday Fashion Files! Labour of Fashion! Thursday Favorite Things! Thursday Moda! Top of the World Style! Fine Whatever! Welcome to the Weekend! Passion for Fashion! Fabulous Friday! Fab Favorites! Friday Favorites! A Forage Fashion! Link Party with Osy! Flashback Fashion Fridays! Weekend Wear Link Up! Sheela Writes! The Weekly Edit! Untamed Style! Oh the colors, oh the detail, oh the YOU are so gorgeous!!! LOVE this skirt to pieces!! Go have the BEST weekend beautiful friend!! I love all of the colors in your skirt! Definitely a very fun and festive look for summer! Thanks for hosting and have a fantastic weekend! Love all the colors! Happy Friday and thanks for hosting the link up! Such a fun and colorful look! I just adore these photos. Your outfit and your beautiful floral backdrop makes me want to grab a margarita!! So fun and festive indeed. Thanks for hosting the link up, stop by ours to night and share this lovely look. 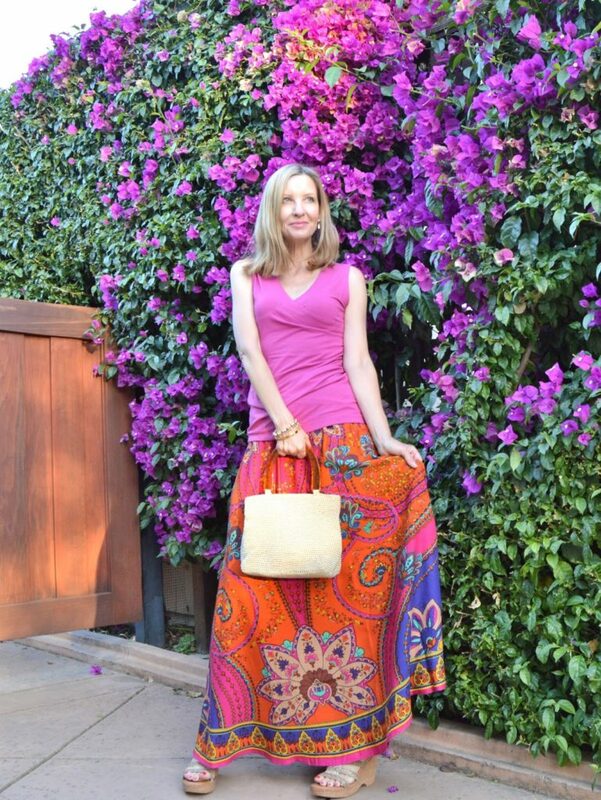 Wowza Dawn—I absolutely love the colors you're wearing!! Now that's a girl after my own heart!! I've seen the soft surroundings catalogs, but have never tried them….may have to remedy that! The bold, vibrant colors are perfect for summer! You look amazing! Have a wonderful weekend! I see the 60d here and love it! I see the 60's here and love it! This skirt is sooo beautiful. And I love the back drop against the purple flowers. Thanks for sharing and hosting the link up as well. That skirt is beyond FAB!!!! Come see how I wore ruffles for work & play at the blog – Have a great weekend! 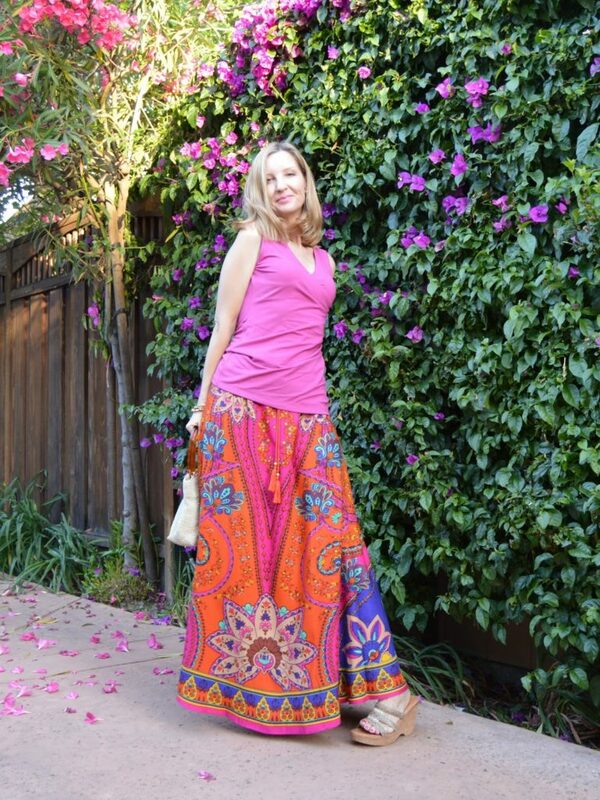 Such fun colors in this look and perfect with the flowers! Loving this bright, fun look. Gorgeous! Enjoy your weekend. Beautiful gypsy vibes. Thanks for sharing Dawn, you look great. The printed skirt is gorgeous! I love it against your backdrop of colorful blooms. Thanks for the link up! Fabulous! Fabulous! Fabulous! 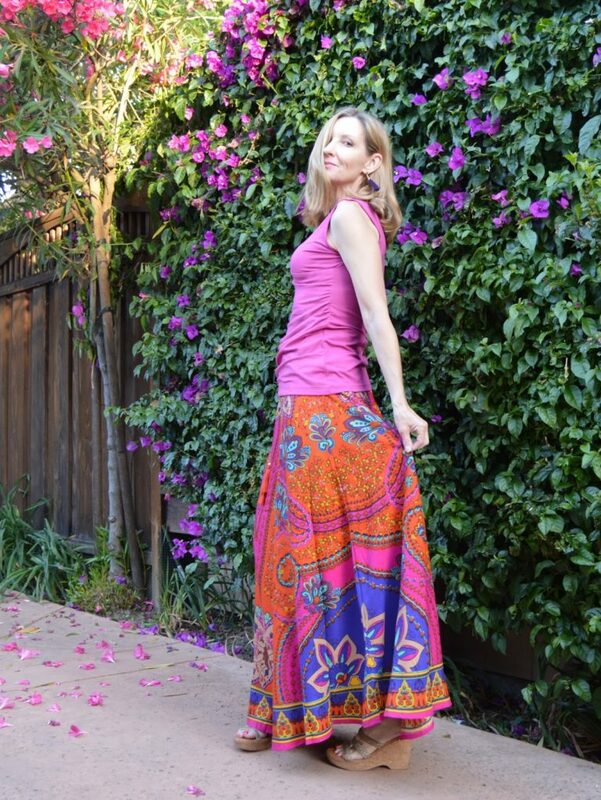 I can't wait to see how amazing this skirt looks paired with other colors, too! Did I say fabulous?! And I finally started my One the Edge of the Week Link Up…for every Friday. Please do stop by and link up! I am going to pin you to my Soft Surroundings board…fun look! Thanks for the link up, Dawn…happy weekend! Looking pretty! Love all the color! Thank you for the featured pic! Wow. 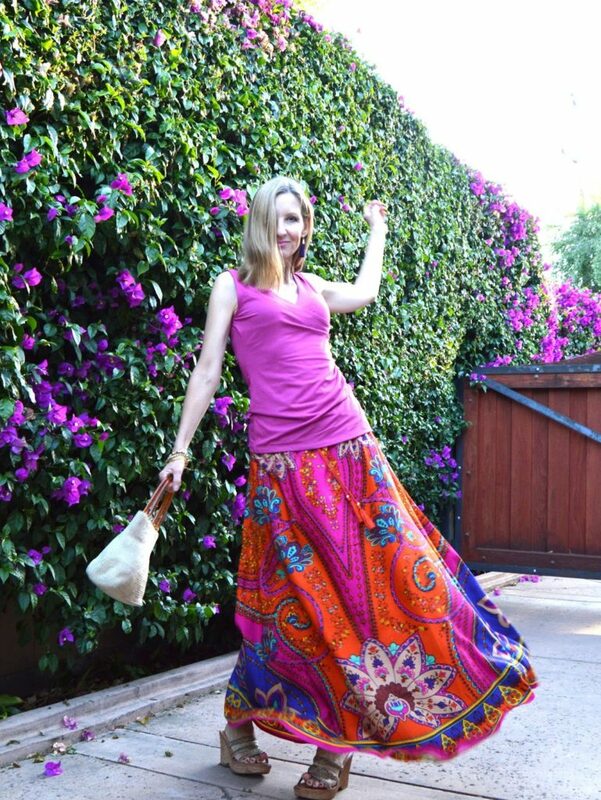 I love the colors on you, the boho vibe of the skirt and the details you mentioned.The oranges and pinks are so pretty and you cant beat a soft material. Looks fabulous! Soft surroundings is great! Their clothing looks so comfortable! I love that look and the backdrop you picked for the photos. It's absolutely perfect! That skirt is beyond gorgeous! Love the colors! Dawn Lucy, you are fabulous! Thanks so much for joining my On the Edge of the Week Link up! I look forward to seeing what you will link up next week! Wow! I love how bright this look is and it incorporates all my favourite colours. Beautiful colors! And a stunning background! 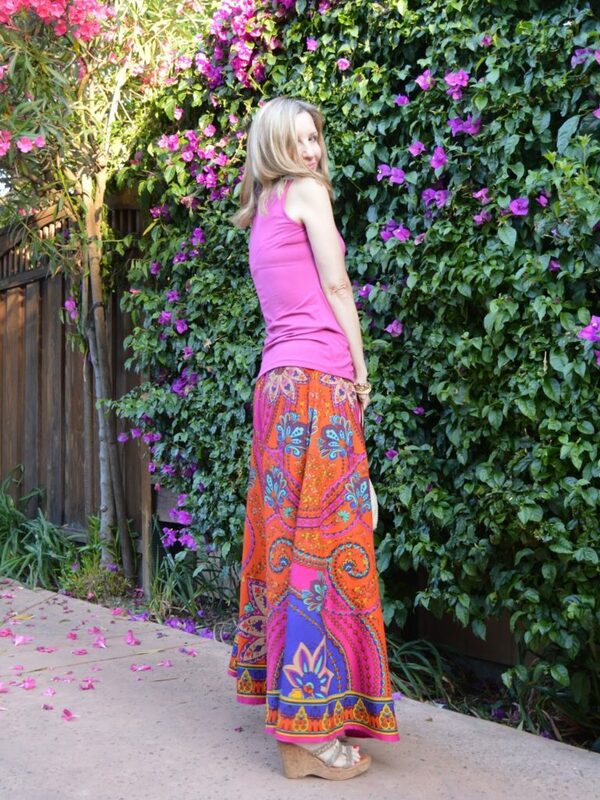 That is a colorful skirt and I love the pattern! That is a beautiful skirt! Like you said, those colors are so pretty and happy! Great outfit! Such a fun and colorful look, perfect for the summer. I really like the skirt. This look can be named "happy summer". It is absolutely fabulous how you incorporates all bright colours into one outfit. I commented earlier but will reiterate that I love these colors on you! 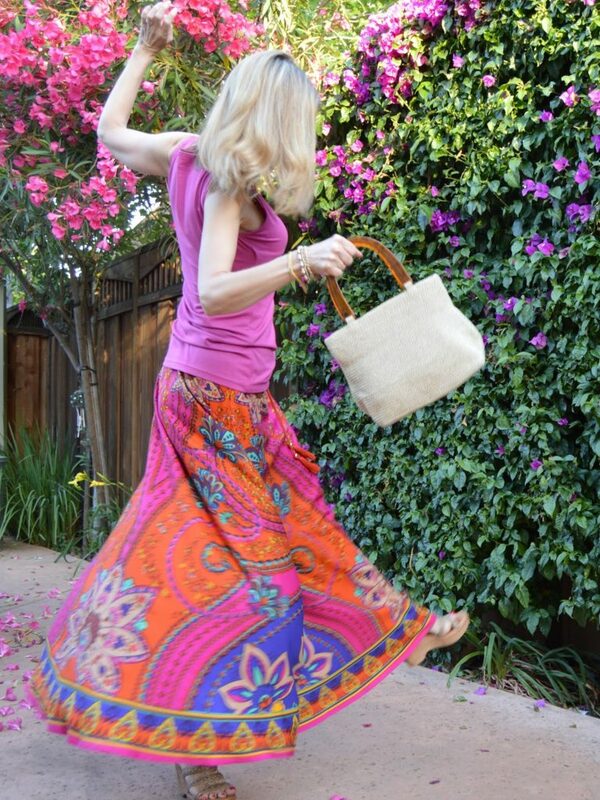 This is a gorgeous skirt and you wear it well!